I think it's safe to say that we have all experienced "The one that got away", or sometimes "The one that shouldn't have got away, but did." In far fewer instances do we encounter "The one that perhaps should have got away, but didn't." I have a tale for you of just that. It happened sometime in September out at Block Canyon, Fishtails, in what was one of the finer tuna bites of recent blue-water memory. Captain Doug, Gavin and I set-up on the chunk, which was the preferred method for enticing tuna and began our drift. It was not long till we were tight to a yellowfin on the spinning gear and following a spirited battle, by both the fish and angler, we boated the 80 lb tuna. Oh yeah, the leader broke as we sunk the gaff, but this is not where this story ends. Behind the boat, we had attracted a different class of critter. A twelve inch squid danced in our underwater lights and while he took interest in our boat, we took interest in putting him on a hook and seeing what would eat him. A quick dip of the net and we were in business with our first live bait of the evening. Following a brief 10 minute soak, our live squid was taken. Line ran out with pace from the Stella spinning reel and the drag was engaged, hook set! "Fish on, or off? ", Capt Doug questioned, as the line seemed to limp, then came tight again with some serious vigor. We quickly found ourselves engaged in a straight up and down battle, which is typical with larger tuna. Our setup had a 100 lb leader to 80 lb braid, and on a spinning rod our intention was to play him in gradually, the ole slow and steady wins the race tactic. This is all fine and dandy except this fish had a different plan and began heated runs back from once he came - the deep. I continued to push the drag up as the 300 yd spool was growing thin, "Not long till we can see the knot on this one" I said as I continued to push the drag beyond where I wanted to - expecting to feel a sudden release of pressure as the fish broke something somewhere. However this did not happen - the fish turned and we were able to gain on him. At about 50 minutes into the struggle, the fish was 30 yards behind the boat on the surface, line nearly straight out, we could make out his profile in the darkness with help from the aft spreader lights. He was backwards and upside down. It appeared the beast was tail wrapped or something, it was difficult to tell. "What the he...." I was cut off mid-sentence as a vicious tail slap righted the fish and it nearly porpoised as it went on it's most impressive run yet. Against serious pressure and a wet deck, I lost my footing and landed hard against the side of the boat. It is the closest I have come to being pulled over in my 5 year canyon career. Now, it was personal. Another forty-five minutes and this fish had nearly had its fill, once again coming up behind the boat, this time a fair bit closer - 10 yards or so. "Certainly coming in backwards" Gavin remarked, and he was right. A quick gaff in the fish's head and a tail rope before he got any other ideas and over the rail! 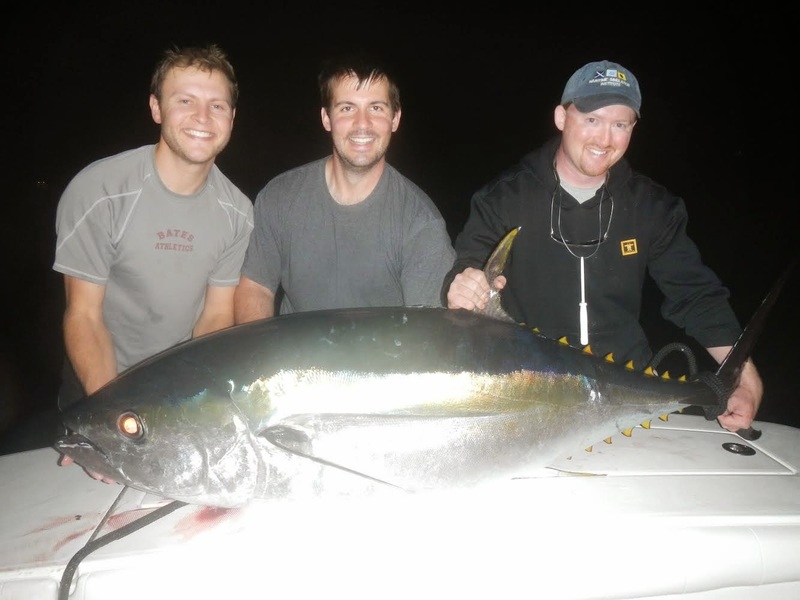 One snagged Bigeye tuna ~ 170lbs! How that half an inch of skin held this fish, we will never know, nor will he! Hot damn! The mysteries of life... Good work though!!! They fight better that way Capt!